Gigabit Ethernet is part of the Ethernet family of computer networking and communication standards. The Gigabit Ethernet standard supports a theoretical maximum data rate of 1 gigabit per second (Gbps) (1000 Mbps). When first developed, some thought achieving gigabit speeds with Ethernet would require using fiber optic or other special network cable technology. However, that's only necessary for long distances. Today's Gigabit Ethernet works well using twisted pair copper cable (specifically, the CAT5e and CAT6 cabling standards) similar to older 100 Mbps Fast Ethernet (that works over CAT5 cables). These cable types follow the 1000BASE-T cabling standard (also called IEEE 802.3ab). Because of factors like network protocol overhead and re-transmissions due to collisions or other transient failures, devices cannot actually transfer useful message data at the full 1 Gbps (125 MBps) rate. Under normal conditions, however, the effective data transfer over the cable might still reach 900 Mbps if even just for brief periods. On PCs, disk drives can greatly limit the performance of a Gigabit Ethernet connection. Traditional hard drives spin at rates between 5400 and 9600 revolutions per second, which can only handle a data transfer rate of between 25 and 100 megabytes per second. Finally, some home routers with Gigabit Ethernet ports might have CPUs that are unable to handle the load needed to support incoming or outgoing data processing at the full rates of the network connection. The more client devices and concurrent sources of network traffic, the less likely for a router processor to be able to support maximum speed transfers over any particular link. There's also the factor of bandwidth limiting the connection since even if a whole home network can get download speeds of 1 Gbps, even two simultaneous connections immediately halve the available bandwidth for both devices. The same is true for any number of concurrent devices, such as five splitting the 1 Gbps into five pieces (200 Mbps each). You can't usually tell simply by looking at the physical device whether it supports Gigabit Ethernet. 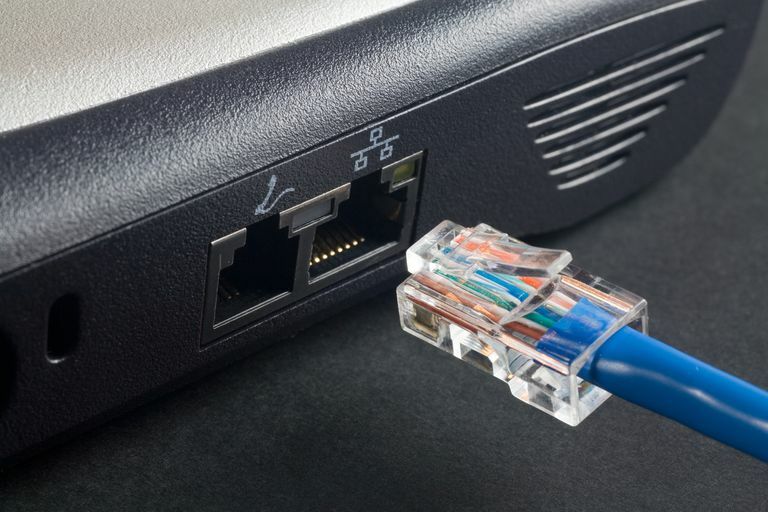 Network devices provide the same RJ-45 connection type whether their Ethernet ports support 10/100 (Fast) or 10/100/1000 (Gigabit) connections. Network cables are often stamped with information about the standards they support. These markings help confirm whether a cable is capable of operating at Gigabit Ethernet speeds but do not indicate whether the network is actually configured to run at that rate. To check the speed rating of an active Ethernet network connection, find and open up the connection settings on the client device. In Microsoft Windows, for example, the Network and Sharing Center > Change adapter settings window (accessible through Control Panel) lets you right-click a connection to view its status, which includes the speed. What happens if your device only supports, say, 100 Mbps Ethernet but you plug it into a gigabit-capable port? Does it instantly upgrade the device to use gigabit internet? No, it doesn't. All newer broadband routers support Gigabit Ethernet along with other mainstream computer network equipment, but Gigabit Ethernet also provides backward compatibility to older 100 Mbps and 10 Mbps legacy Ethernet devices. Connections to these devices function normally but perform at the lower rated speed. In other words, you can connect a slow device to a fast network and it will only perform as fast as the slowest rated speed. The same is true if you connect a gigabit-capable device to a slow network; it will only operate as fast as the slower network.